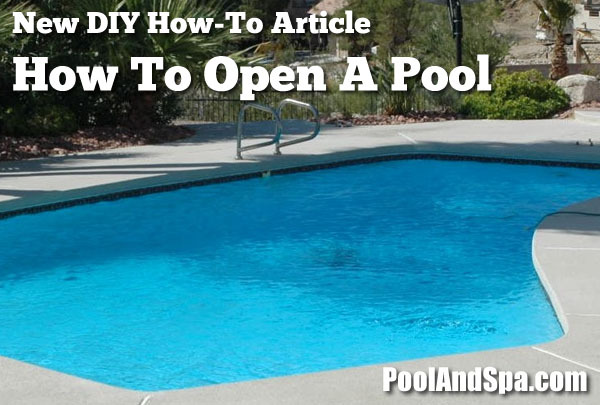 Opening A Pool Watch our new video, "How To Open An Inground Pool & Explaining Pool Chemicals" to learn all the tips and tricks to open up your pool properly for the season. Also included in Part 2 is a detailed section "Explaining Pool Chemicals". Clearing A Green Pool If you open your pool and the water is green, you can watch our new video, "How To Clear A Green Pool" to learn all the best tips and tricks! Also included is the new "How To Backwash A Filter" video instructions as well. A pool properly maintained during the winter months can be prepared for a new season of swimming with a minimum of effort. Pump, hose, or sweep away water, dirt, or debris from the cover and deck. Remove the cover and plugs from all openings. If the water was in good shape at the end of last season, proper cover removal will ensure that your pool opens relatively clear. Turn on the electric power and start up the support system. Check for leaks and proper operation. 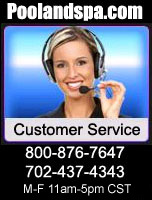 If you find any problems, consult your owner's manual or contact a local pool service company. Have the heater professionally serviced before you use it. Test and adjust the pH and total alkalinity. Super chlorinate and adjust the PH & Alkalinity levels of the water. Run the pump 24 hours a day at the beginning of the season when it may be difficult to get the pool water balanced. You can reduce the pump operating time in one-hour increments once you've got the water in shape. Treat the water with an algaecide. After several hours of operation, test the chlorine level and adjust it as needed. If the chlorine level is high, do not use the pool until it drops to normal levels. Supplies. Take the supplies (chemicals) out of storage and replace those that have exceeded the expiration date. Uncover. Remove the cover, and then clean it. Allow it to dry (to prevent mildew) before folding and storing it for the summer. Equipment. Reinstall or reassemble the pump, filter, and other removed items. Deck. Reinstall ladders, diving board, and other deck fittings. If used at closing time, most of the petroleum jelly used to coat exposed metal fittings will have weathered off. Use a dry terry cloth towel to wipe off the remainder if necessary. Plumbing. Remove the plugs and replace return outlet fittings. Refilling the Pool. Bring the water level up to normal. Electrical. Restore circuit breakers, switches, and time clock trippers to normal operating positions. Cleaning. Restart the circulation equipment and clean the pool. Chemistry. Balance the water chemistry and check the levels frequently during the first few days (until they stabilize). Run the circulation system 24 hours straight for three days or until the water has cleared completely. Depending on how dirty the pool became over the winter, the filter must be backwashed frequently during this period - see How to Clear Up a Green Pool article as well. Remove the leaves and debris from the pool cover with a leaf net and/or skimmer net. Pump off any excess rain water with a submersible pump. If an above ground pool, the excess water may be siphoned off instead. Remove cover. Try to minimize the amount of water and/or debris that gets into the pool water. Some dirty water will always manage to get in - don't worry about it. You will be adding shock to the water and filtering it soon, so a little dirty water will not hurt anyone ! Lay out pool cover and sweep or brush off any remaining debris. If you do not store your cover indoors, and you keep it outside or in a shed, then you do not have to worry about getting the cover particularly spotlessly clean. If you do keep it in the garage or basement, you may want to clean it to a greater extent. Properly fan-fold cover and store away. Empty the water out of any water tubes you may have. On above ground pools, deflate the air pillow. Clean off items and fold properly and store away. Re-attach any deck equipment you have such as ladders, rails, diving boards, etc. Make sure to reconnect any grounding wires or straps that may have been attached to the metal parts last year. Lubricate all bolts on the dive board, ladders and/or rails. This will prevent them from rusting over the summer. Remember, you are probably the one who will be closing the pool, so you want the bolts to come off easy at closing time! Re-install the skimmer baskets and any return jet eyeball fittings. If an above ground pool, you may have to re-attach the actual skimmer and return fittings onto the pool (depending on how the pool was closed). If an above ground pool, also hookup any hoses from the skimmer and return jets to the pump and filter. Hook up pump, filter and any other additional equipment you might have (booster pumps, spa equipment, waterfall circulation pumps, heaters, etc.). Turn on the power to the pool system. You may have to turn on the circuit breaker from the house. Start and check system. Check for leaks or drips. Make sure any grounding straps or wires are properly connected to the pump and any other components that need them. Make sure pump primes properly. Check for proper flow. Backwash the filter thoroughly. Add new DE if you have a DE filter. If some pieces of equipment do not appear to be operating properly, you might want to first check our Info / Tips page under the POOL TROUBLESHOOTING section. 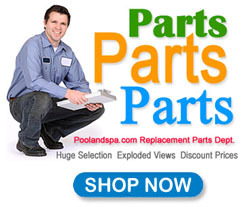 If you cannot repair the problem yourself, contact a local pool professional for assistance. 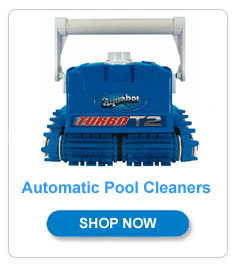 Shock the pool with any chlorine shock product. This is available in liquid or granular form. You want to add enough to raise the chlorine level of the pool to at least 3.0 ppm (darker yellow color in most liquid test kits). If you use granular shock, do not throw it directly into the pool ! You could bleach and stain the liner. It is best to mix the granular shock chlorine in a bucket and then add that mixture into the skimmer while the system is running. 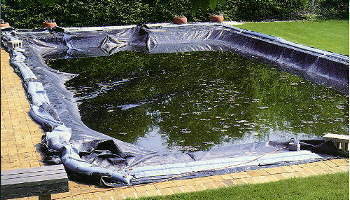 If your pool is a "green swamp" when you open it, see How to Clear Up a Green Pool for further information. If your pool water is relatively clear, accurately test your water for chlorine, PH and Alkalinity levels. If available, also test for Stabilizer (cyanuric acid). Adjust these chemicals to the proper levels. Add a high quality algaecide to the water. 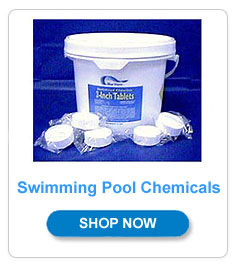 See E-Z Pool Water Chemistry for more information. Let pool run for at least 24 hours. Vacuum any debris out of the bottom. Retest water. Do not go into pool until water is crystal clear and chlorine level is under 2.0 ppm (medium yellow color on most test kits). Obvious drips coming from filter tank, pump or visible pipes. Try tightening the fittings. If you cannot get leaks to stop, contact a local pool professional. Sand in pool under or near the return jets. This may mean the pool has an underground pipe leak or, if you have a sand filter, it could mean that something in the sand filter is cracked. If you are loosing water as well, we suggest contacting a local pool professional. If you are not losing water, then take apart the sand filter and look for a cracked part. DE in pool under or near the return jets. This means that there is something in the DE filter that is ripped or cracked. Take the filter apart and look for cracked part or ripped element. DE filter isn't putting out enough water pressure and/or isn't effectively filtering the pool. You should backwash the filter immediately. Add new DE. If problem persists, filter may be in need of an "acid wash". If you do not know how to do this, we suggest contacting a local pool professional. Sand filter isn't putting out enough water pressure and/or isn't effectively filtering the pool. You should backwash the filter immediately. If problem persists, filter may be in need of a sand change. If you do not know how to do this, we suggest contacting a local pool professional. You notice many air bubbles mixing with the water coming out of the return jets. Probably means that there is a suction line leak, usually under or by the skimmers. You could try digging down and see what you can see, but we suggest contacting a local pool professional to repair something like this ! You notice settled or wet dirt. You see bricks or patio blocks around the skimmers or return jets settling or sinking into the ground. Probably means an underground pipe leak at that point. You could try digging down and see what you can see, but we suggest contacting a local pool professional to repair something like this ! Pump makes a loud squealing noise, it heats up or is not running to its full capability. This indicates that the pump is in need of professional service. 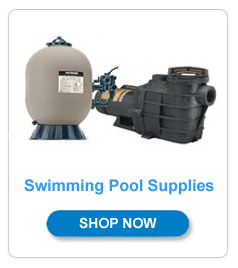 Either remove it and bring it to a pool store or pump shop for repair - or replace the pump. If the pool water level goes down to the bottom of the skimmer and stops, this usually means that it is a suction line leak, most likely directly under the skimmer. We suggest contacting a local pool professional to repair something like this ! If the pool water level goes down to the bottom of the return jets and then stops, this usually means that it is a return line leak, most likely directly by the wall jet return fitting - but it could be anywhere in the return line. We suggest contacting a local pool professional to repair something like this ! If the pool water level goes down to the top, middle or bottom of the light unit, this usually means that the light is leaking. This is usually the fitting in the light niche where the metal or plastic conduit pipe is attached to the metal niche. We suggest contacting a local pool professional to repair something like this ! If the water level goes down to any other level on the side walls and then stops, this usually means that the leak is in the liner on the pool side wall or possibly in the step unit gasket. Inspect the pool visually around the water level and check to see if you can see a hole. Check the area where the LADDER comes in contact with the liner. This is a very common leak point ! If you cannot clearly see a leak hole, we suggest contacting a local pool professional to locate & repair the leak. If the water level goes down past they side walls, then it usually means that the leak is in the pool floor. This is bad! You do not want all the water to drain out of the pool. It is bad for the liner and very bad for the pool walls - you do not want the pool to fall in ! If you see that you are quickly losing all the water in your pool, put a hose in the pool, start to refill it and contact a local pool professional to locate & patch the hole. distributed in any manner without the prior expressed written consent of PoolAndSpa.com Inc. Any Copyright infringement will be prosecuted to the fullest extent of the law.